Scroll conveniently to find different designs, shapes, sizes and materials that will leave you wanting for more. 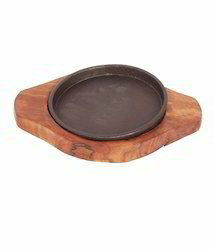 Base Size: 13" x 7"
These days the way of food serving, specially snacks presentation on sizzlers has become very popular. From Snacks Dishes like Tikka & Kebabs to serving hot deserts, like Brownie cakes, sizzlers have extensively been used to render that sizzling effect. We offer an array of Sizzler in Round Shape with & without handles. Being a most reliable organization, we are engaged in offering a wide range of Cavity Sizzler Plate. We Deals in Sizzler Plate OVAL.